On all orders over £50 we offer free standard delivery to all mainland UK addresses. Standard delivery to all UK mainland addresses is £4.95 and takes approximately 3-5 working days. We offer next day delivery to all UK mainland addresses. This costs £7.95. Orders placed before 1pm will be delivered on the next working day. We deliver internationally. However, international customers should contact us before making their purchase to confirm pricing and delivery speed. It is certainly possible to return items to us, excepting pierced earrings. Simply complete the 'Return Merchandise Authorization' slip via your account on our website within 24 hours of receiving your items and we will contact you with further details of how to return. Please scroll down this page to find out more about 'Privacy and Cookies' at Gemma Redmond Vintage. 1.2 This policy is a legally binding document, and forms part of the contract of sale between you and us made under our suite of documents comprising our Terms and Conditions. 2.1 On all orders over £50 we offer free standard delivery to all mainland UK addresses. 3.1 We will deliver to the following countries and territories: England, Scotland, Wales and Northern Ireland. 3.2 We will also endeavour to deliver to all international destinations where possible. International customers should contact us prior to purchasing to confirm that shipping can be arranged and that the costs and method of shipping are acceptable. By doing this we can ensure that the cost of international shipping offers the most favourable rates for our customers. (b) if your delivery address is on the United Kingdom mainland, you will also be able to select Special Delivery Guaranteed for next day delivery. 4.2 If you place your order before 1pm Monday to Friday, these time periods run from the close of business on that day; if you place your order after 1pm Monday to Friday, or on a non-working day, these time periods run from the close of business on the next following working day. 4.3 If you require this service and order your goods on a Saturday, or Sunday you will receive your goods the following Tuesday. 4.5 Under certain circumstances we may not be able to process your order in the timescales quoted above and in these periods this information will be indicated on our website with the dates when normal dispatch conditions will resume. 4.6 During these periods customers are invited to contact us by phone or email if they have specific urgent requirements or concerns with respect to order and delivery. 4.7 We will make every endeavour to deliver goods within the estimated timescales. However delays are occasionally inevitable due to unforeseen factors or events outside our control, for example extreme weather, flood or fire. Gemma Redmond Vintage shall have no liability for any delay or failure to deliver the products within the estimated timescales. 4.8 If your delivery requirements cannot be satisfied by the above, customers are requested to contact us by email, specifying your needs and we will endeavour to satisfy your requirements. 5.2 Applicable delivery charges will depend upon the delivery method you select, the location of the delivery address. (a) We offer free delivery for orders over £50 to any single address in the UK. This free service will not apply if multiple items are purchased and sent to multiple addresses. (b) The cost of Standard Delivery is £4.95 and, your order will be delivered via a courier, or alternative service, selected by our selves. (c) The cost of “Special Delivery Guaranteed” is £7.95. Your order will be delivered via Royal Mail or a courier, providing a similar service, selected by our selves. 6.1 We will endeavour to deliver to all international destinations where possible. 6.2 International customers should contact us prior to purchasing to confirm that shipping can be arranged. 6.3 We will confirm by email with the customer and that the costs, method of shipping and timescales are acceptable. 6.4 We will endeavour to ensure that the cost of international shipping offers the best solution and the most favourable rates for our customers. 6.5 Having agreed the shipping method with the customer and we have received the order and payment we will aim to process the order ready for shipping within 3 working days. 6.6 Local import taxes / duties are the responsibility of the customer. You may wish to call your local Customs / Revenue Authorities for additional information and advice. 6.7 The Local import taxes / duties processes carried out by the Customs / Revenue Authorities can result in delays, and may affect the delivery timescales we have provided to you. 6.8 Delivery tracking may not be possible for international orders to the delivery destination. Customers will be advised at the time of purchase if full or partial delivery tracking is available. 7.1 Delivery tracking is available in respect of all UK orders for our products. 7.2 To track your delivery follow the instructions provided on your order confirmation. 7.3 For international order tracking see 6.8 above. 8.1 All deliveries must be received in person at the delivery address, and a signature must be provided. 8.2 Whenever possible our delivery service provider will notify you in advance of attempting to make a delivery requiring signature. 9.1 If an initial delivery attempt is unsuccessful, our delivery service provider will make at least 1 more attempt to deliver the products in your order. 10.1 If your products remain undelivered despite our delivery service provider making at least 1 more attempt to deliver them, the delivery service provider will leave a card at your address, with instructions on how you may collect your products, including a time limit for collection. 11.1 If you experience any problems with a delivery, please contact us using the contact details that we publish on our website or otherwise notified to you. 11.2 If our delivery service provider is unable to deliver your products, and such failure is your fault and you do not collect your products from our delivery service provider within the relevant time limit we may agree to arrange for re-delivery of the products; however, we reserve the right to charge you for the actual costs of re-delivery even where the initial delivery was free of charge. 12.1 This website is owned and operated by Gemma Redmond Vintage. 12.2 Our principal place of business can be found in our Terms and conditions of sale. 12.3 You can contact us by writing to the business address, or by email or telephone details of which are all provided on our website. (a) we receive from you a completed "Return Merchandise Authorization" slip via our web site from you within 24 hours, after the receipt of the products, to request a refund and stating the reasons why you wish to return the product. The "Return Merchandise Authorization" slip can be completed on our web site following the procedure in section 3 below. (b) we receive the returned product within 10 days following your receipt of approval of the "Return Merchandise Authorization" slip by ourselves. (c) the returned product is unused, in its original packaging as shipped to you and with any labels still attached, if fitted, the security tag has not been removed or tampered with, and otherwise complete and in the condition as received by you. (d) the branded packaging is returned complete and undamaged with the returned product. Many of our products include the original manufacturers packaging and labels. For many customers this adds to the appeal, charm and value of the product. 3.1 In order to take advantage of your rights under this policy, you must complete a "Return Merchandise Authorization" slip via our web site within 24 hours, after the receipt of the products, to request a refund and stating the reasons why you wish to return the product. (a) Access the "Orders History" section of your account and select the order from which you want to return an item. (b) Select the product(s) that you wish to return by checking the box next to it. (c) include an explanation, in order for us to understand why you want to return this product. (d) When the form is complete, click on "Make an RMA slip", and the request is sent to us. 3.3 When we have received the "Return Merchandise Authorization" slip via our web site we will reply to you within 24 hours to provide you with a returns number and the address details to where the returned products should be sent. 3.4 Products returned under this policy must be sent by Royal Mail Special Delivery Guaranteed or equivalent international carrier, signed for and insured delivery, to the address provided by ourselves. A covering note quoting the returns number shall be included. 3.5 You will be responsible for paying postage costs associated with returns under this policy. 3.6 You will be responsible for ensuring the products are securely packaged as we cannot be held responsible for any loss or damage incurred in the return of the products. 5.3 For international returns we will not refund any customs or taxes paid by you for the import of the products. 5.4 For international returns we will not refund any customs charges or taxes paid by us to import the returned goods. These costs will be deducted from the original purchase price before the refund is made to you. 5.5 We will not refund to you any costs you incur in returning the product to us. 5.6 We will not refund to you any costs we incur in you returning the product to us. 5.7 We will refund any money received from you using the same method originally used by you to pay for your purchase. 5.8 We will process the refund due to you as soon as possible and, in any event, within 5 working days following the day we receive your returned product. 5.9 We will send you an email to let you know that we have received your return and are processing the payment. After you have received this email, please allow a further 10 working days before your account is credited. (c) if we do not receive payment of such additional amount within 14 days of issuing a request for payment, we may dispose of the returned product at our sole discretion without any liability to you. 7.1 This website is owned and operated by Gemma Redmond Vintage. 7.2 Our principal place of business can be found in our Terms and conditions of sale. 7.3 You can contact us by writing to the business address, or by email or telephone details of which are all provided on our website. 3.3 International customers are requested to contact us prior to placing an order to establish an agreed shipping method and cost so that this can be added to the total cost of the order. 3.4 To enter into a contract through our website to purchase products from us, the following steps must be taken: you must add the products you wish to purchase to your shopping cart, and then proceed to the checkout; if you are a new customer, you must then create an account with us and log in; if you are an existing customer, you must enter your login details; once you are logged in, you must select your preferred method of delivery and confirm your order and your consent to the Terms and Conditions of our website; you will be transferred to Worldpay our payment service provider's website, and our payment service provider will handle your payment; we will then send you an initial acknowledgement; and once we have checked whether we are able to meet your order, we will either send you an order confirmation at which point your order will become a binding contract or we will confirm by email that we are unable to meet your order. 3.5 You will have the opportunity to identify and correct input errors prior to making your order by checking your order and removing or adding itemsbefore you continue with the ordering process. 4.1 The following types of products are available on our website from time to time: Designer and unsigned vintage costume jewellery. 4.2 We will change the products available on our website, and we do not undertake to continue to supply any particular product or type of product. 5.3 VAT is not currently applicable to the purchase of items on this website. All amounts stated for postage are either exempt of VAT or inclusive of VAT. (c) an administration fee of GBP 25.00. 7.4 We do guarantee that unless there are exceptional circumstances all deliveries of products will be dispatched within 3 days following the receipt of payment and the date of the order confirmation. 7.5 We will deliver products to the UK, and endeavour to deliver to all international destinations where possible. International customers should contact us prior to purchasing to confirm that shipping can be arranged and that the costs and method of shipping are acceptable. By doing this we can ensure that the cost of international shipping offers the most favourable rates for our customers. (b) ending at the end of 14 days after the day on which the products come into your physical possession or the physical possession of a person identified by you to take possession of them or, if the contract is for delivery of multiple products, lots or pieces of something, 14 days after the day on which the last of those products, lots or pieces comes into your physical possession or the physical possession of a period identified by you to take possession of them. 8.3 In order to withdraw an offer to contract or cancel a contract on the basis described in this Section 8, you must inform us of your decision to withdraw or cancel as the case may be. You may inform us by means of any clear statement setting out the decision. In the case of cancellation, you may inform us by email using the email address on our web site. To meet the cancellation deadline, it is sufficient for you to send your communication concerning the exercise of the right to cancel before the cancellation period has expired. 8.4 If you cancel a contract on the basis described in this Section 8, you must send the products back to us to GEMMA REDMOND VINTAGE, 5 ROBY MILL, SKELMERSDALE, LANCASHIRE, WN8 0QF, UK. You must comply with your obligations referred to in this Section 8 without undue delay and in any event not later than 14 days after the day on which you inform us of your decision to cancel the contract. You must pay the direct cost of returning the products. (a) The supply of earrings with the pierced type of fitting. (f) All items or products for sale are, unless otherwise stated, believed at the time of sale to be genuine pieces of vintage jewellery. Not all items or products for sale are in original condition. Some may show signs of age that are part of their unique character and should not be considered as imperfections. We recommend to preserve their condition by handling with care and avoiding contact with liquids. (g) The law prohibiting certain metals, such as nickel and nickel compounds being used in the manufacture of costume jewellery came into effect in 2002. (h) Customers please be aware that you may be allergic to some of the metals contained in some of these pieces, causing skin rash and irritation. Gemma Redmond Vintage takes no responsibility for any allergic reaction to these metals and the buyer buys and wears the said jewellery entirely at his or her own risk. (i) Our vintage items are not necessarily unique. We may have at any one time more than one of each item or product for sale. (j) To the best of our knowledge and belief, dates, designs and descriptions are accurate. We will not be held liable to you or any third party for any inaccuracies, or innocently misleading, statement or representation about any item or product for sale on our website. (k) Any statements made on our website regarding any item or product for sale do not constitute or represent any form of advice, nor is it intended to be used as such. (l) All information provided is subjective and its accuracy is expressly not guaranteed or warranted. 10.1 If you believe that products you have purchased from us breach any of the warranties set out in Section 9.2, please contact us, as soon as possible, and ideally within 24 hours, following receipt of the product, to discuss the issue and if necessary make arrangements for the return of the products. 10.3 If you return a product in contravention of these terms and conditions, and you do not have any other legal right to a refund or exchange in respect of that product we will not refund the purchase price or exchange the product. 11.4 We will not be liable to you in respect of any business losses, including without limitation loss of or damage to profits, income, revenue, use, production, anticipated savings, business, contracts, commercial opportunities or goodwill. 12.2 We may cancel a contract under these terms and conditions by written notice to you if we are prevented from fulfilling that contract by any event beyond our reasonable control, including without limitation any unavailability of products, or any power failure, industrial dispute affecting any third party, governmental regulations, fire, flood, disaster, riot, terrorist attack or war. 14.2 These terms and conditions shall not govern the provision of any services by us or any third party in relation to the products (other than delivery services). 20.1 Subject to Section 11.1, these terms and conditions of sale, together with our delivery-policy, online-shop-terms-and-conditions, privacy-and-cookies-policy, and our returns-policy shall constitute the entire agreement between you and us in relation to the sale and purchase of our products and shall supersede all previous agreements between you and us in relation to the sale and purchase of our products. 23.1 This website is owned and operated by Gemma Redmond Vintage. 23.2 Our principal place of business is 5 ROBY MILL, SKELMERSDALE, LANCASHIRE, WN8 0QF, UK. 23.3 You can contact us by writing to the business address, or by email or telephone, details of which are all provided on our website. This privacy notice provides you with details of how we collect and process your personal data through your use of our site www.gemmaredmondvintage.com, including any information you may provide through our site when you purchase a product or service, sign up to our mailing list or take part in a prize draw or competition. Gemma Redmond is the data controller and we are responsible for your personal data (referred to as “we”, “us” or “our” in this privacy notice). Postal address: 5 Roby Mill, Wigan, Lancashire, WN8 0QF. It is very important that the information we hold about you is accurate and up to date. Please let us know if at any time your personal information changes by emailing us at hello@gemmaredmondvintage.com OR by visiting http://www.gemmaredmondvintage.co.uk/my-account and editing your details for yourself. 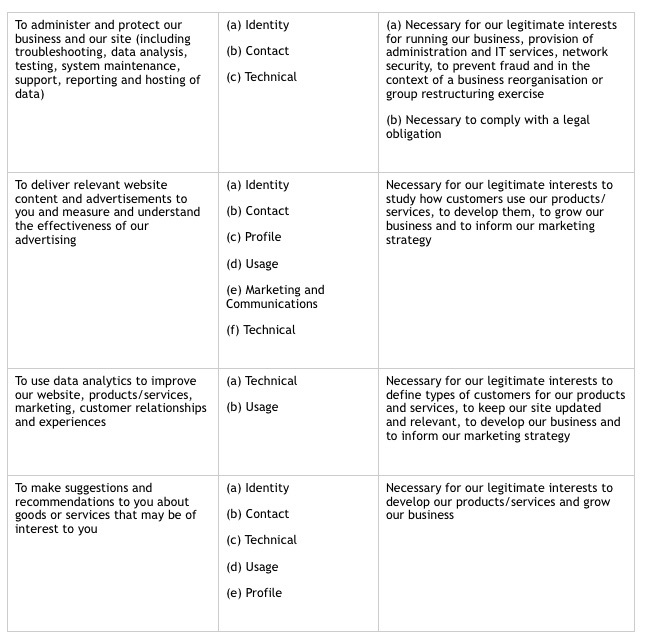 Technical Data from third parties, such as Mailchimp, based outside the EU, and Equiphase, based inside the EU. Contact, Financial and Transaction Data from providers of technical, payment and delivery services such as Worldpay, based outside the EU, American Express, based outside the EU, PayPal, based outside the EU and Mailchimp, based outside the EU. Generally, we do not rely on consent as a legal ground for processing your personal data, other than in relation to sending marketing communications to you via email or text message. You have the right to withdraw consent to marketing at any time by emailing us at hello@gemmaredmondvintage.com OR by visiting http://www.gemmaredmondvintage.co.uk/my-account and editing your details for yourself. We may process your personal data for more than one lawful ground, depending on the specific purpose for which we are using your data. 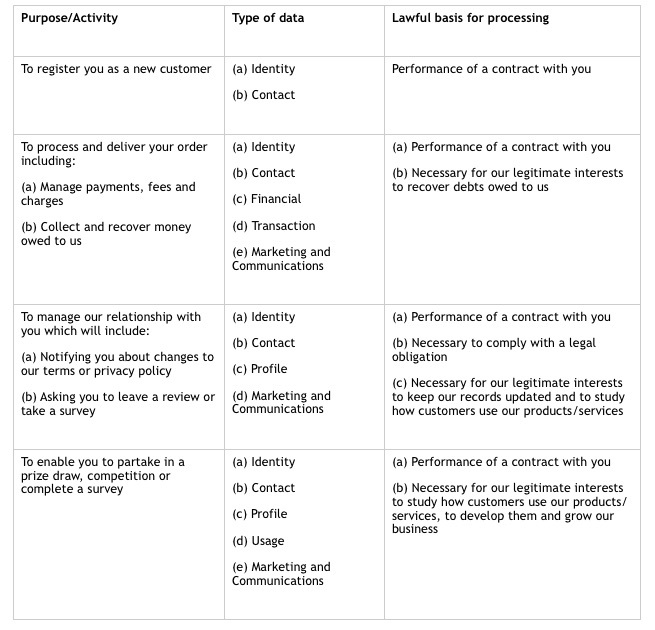 Please email us at hello@gemmaredmondvintage.com if you need details about the specific legal ground we are relying on to process your personal data where more than one ground has been set out in the table below. You can ask us or third parties to stop sending you marketing messages at any time by logging into the website and checking or unchecking relevant boxes to adjust your marketing preferences OR by following the opt-out links on any marketing message sent to you or OR by emailing us at hello@gemmaredmondvintage.com at any time. We will only use your personal data for the purposes for which we collected it, unless we reasonably consider that we need to use it for another reason and that reason is compatible with the original purpose. If you wish to find out more about how the processing for the new purpose is compatible with the original purpose, please email us at hello@gemmaredmondvintage.com. Please email us at hello@gemmaredmondvintage.com if you want further information on the specific mechanism used by us when transferring your personal data out of the EEA. If you wish to exercise any of the rights set out above, please email us at hello@gemmaredmondvintage.com.